A Message from the Creator of GOTCHA! INTRODUCING GOTCHA! A classic, timeless board game where backgammon, checkers, and chess meet. I have always loved playing board games my entire life. I grew up in the 60s and 70s, before there was ever such a thing as video games. I loved playing all the classic, iconic games such as Checkers, Chess, Monopoly, Parcheesi, Life, Candyland, Chutes and Ladders, Mancala and so many others. These were the games that my generation grew up playing, as did my parents’ generation, and generations before them. As much as I loved all those games, I’d have to say my all-time favorite board game was and is to this day, Backgammon. I think what I liked most about playing Backgammon was because it is one of the few games ever invented that provided me with an intellectual challenge, which I could control, as well as subjecting me to the sheer dumb luck of the roll of the dice, over which I had absolutely no control. That rare combination of a game requiring skill, strategy, and luck fascinated me and had me hooked for life. It also provided me with an essential quality that is core to the GOTCHA! experience – the ability to escape the chaotic pace of daily life for a few moments each day. GOTCHA! meets all of the standards of the great classic games. It’s easy to learn how to play, the rules are very basic with a couple of fun and interesting twists, and yet it will severely challenge your mind and strategic thinking ability, test your tolerance for risk, and subject you to the pure luck of the roll of the dice. In other words, GOTCHA! pretty much reflects how life works every day. For those of you “on the go”, constantly busy types, a single game of GOTCHA! can take as little as 2-3 minutes to play, or it can take 15-20 minutes to play, depending on one’s luck and the skill of the players. If you’re a competitive person like I am, GOTCHA! will get your competitive juices flowing freely each and every time you play, whether you’re just trying to beat the computer or trying to beat your family, friends, or the rest of humankind around the world. The original basic concept of GOTCHA came to me in a dream a few years ago (seriously). Now that GOTCHA has become a reality, it is my dream, and my sincere, heartfelt wish that each and every one of you will derive countless hours of enjoyment playing GOTCHA for the rest of your lives. Hopefully you will also pass on the love of playing GOTCHA to your children, their children, and many generations to come. It is my ultimate dream that GOTCHA will someday join the ranks of classic, generational, iconic board games and live on forever. Ok, enough talk, start playing. 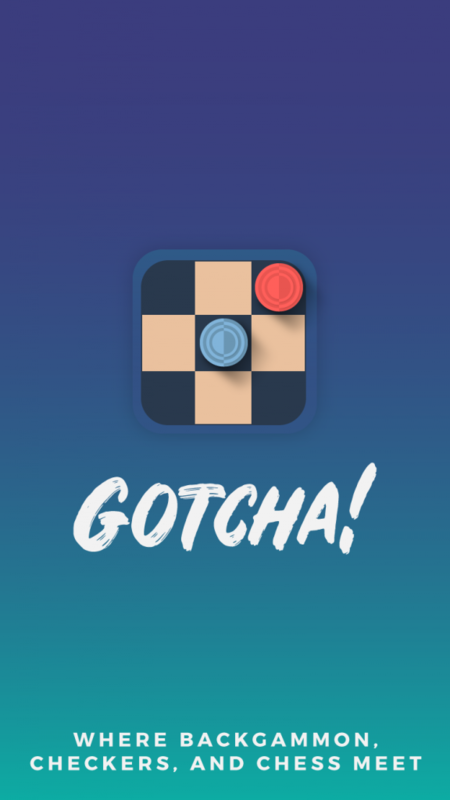 But before you begin, a word of warning — GOTCHA is a highly addictive endeavor. Make sure to first complete whatever items are on your To Do List today before playing GOTCHA!, or else you’ll never get anything else done, other than becoming a GOTCHA! guru that much quicker. The game is played between two opponents. The objective is to capture all of your opponent’s pieces before he/she captures yours. The game board is square, 13 by 13 spaces. Each player starts with 13 pieces – seven pieces are placed in the back row, every other space (1/3/5/7/9/11/13), and six pieces are placed in the next row, again every other space (2/4/6/8/10/12). Each player must select one (and only one) of their 13 pieces to be designated as “The Chosen One, sort of like the Queen in Chess. Each piece can be moved forward, backward, left or right. “The Chosen One” piece can additionally move diagonally forward/backward/left/right. Each move in a player’s turn is based on the roll of the dice. The dice rules for GOTCHA! are the same as with Backgammon. You get to move the number of spaces for each of the two numbers rolled by the two dice. For example, if you roll a 4 and 2, you get one move of 4 spaces and another move of 2 spaces. You can move either one of your pieces both moves (i.e. one piece moves both 4 spaces and 2 spaces), or two pieces one move each (i.e. one piece 4 spaces and another 2 spaces). If you roll doubles, you get four moves of that number rolled. For example, if you roll double 4s, you get four moves of 4 spaces each. So you have multiple options – you can move one piece four moves of 4 spaces each, or two pieces two moves of 4 spaces each, or two pieces one move of 4 spaces each and a third piece gets two moves of 4 spaces, or you can move four pieces one move of 4 spaces each. You get the idea. A player captures an opponent’s piece by landing directly on its space, and that piece is removed from the board. Whenever a player captures one or more of an opponent’s pieces during a single turn, he gets to keep his turn and may roll again. A player may keep his turn as long as he continues to capture at least one of his opponent’s pieces each turn. Throughout the game, whenever one of a player’s regular (non-“Chosen One”) pieces captures an opponent’s “Chosen One” piece, that regular piece becomes another “Chosen One” piece, so it can now move diagonally as well. If a player captures an opponent’s “Chosen One” piece with his own “Chosen One” piece, then his piece stays a “Chosen One” as is. Once a player has captured all of his opponent’s pieces, he is the winner, the game is over, and it is time for an immediate rematch!